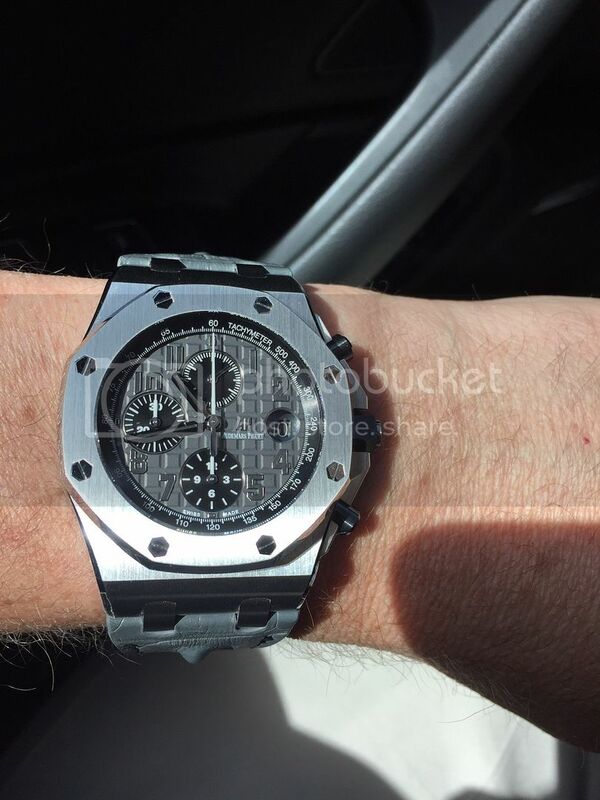 TimeZone : Audemars Piguet » The "Elephant" in the room! 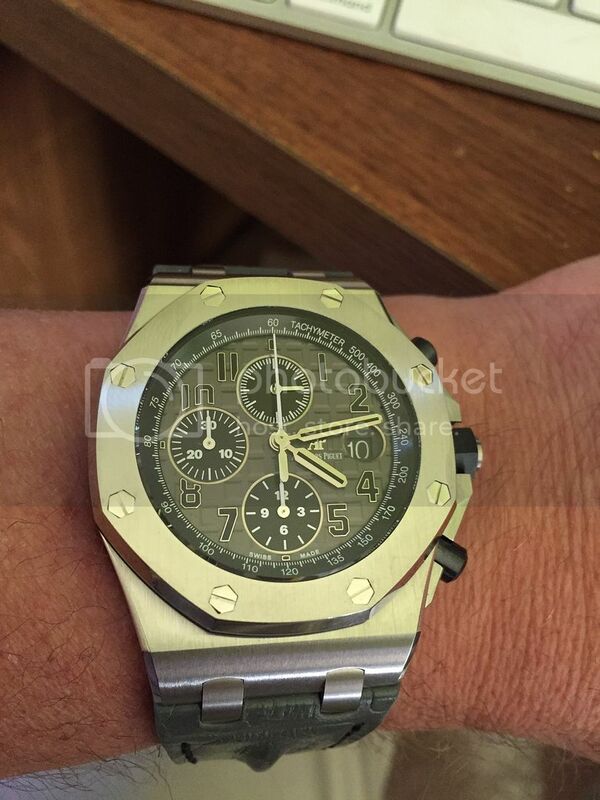 In my mind, the 2 most iconic watches from AP are the Royal Oak Automatic and the Royal Oak Offshore. That being said, I had not been drawn that much to the ROOs. Partly because at 44mm they seemed a bit too large and impractical, and partly because they were too "sporty", at least some of the variations. It has taken me a long time to understand that what I am really looking for is luxury with a touch of sportiness. I certainly found that with my newly acquired Royal Oak Automatic 15400, but I decided to give the ROO a second look. I was very pleased to see the size at 42mm, but more importantly I was also particularly intrigued by the slate grey dial version, also known as the elephant. My local AD had number of the 42mm available to audition, but one look at that slate grey dial and I was hooked. Now here are some more more pics, with the plastic removed, revealing the stunning bezel. It still amazes me how different lighting can dramatically alter the look of the dial. And the horseback strap is simply spectacular, and truly compliments the look and overall feel of the watch. It is hard to capture in photos (at least by me), but the workmanship (particular the bevelling) around the crown guards is a work of art. My only minor quibble is the relative weakness of the lume, but I understand this has never really been characteristic of these watches. This is a magnificent timepiece, and i feel fortunate to be able to own one. I will be in Monte Carlo next month as part of an anniversary cruise with my wife. I plan on visiting the Boutique and perhaps adding a nice waterproof strap. Thanks to Howard for his continued support and sage advice.